Hi loves! Today I'll be taunting you with a super pretty polish, which sadly isn't available any more :-( EDIT: Right now the box seems available!. But, maybe you'll hunt it down through a blog sale or something, I just had to share my pictures with you! Every month Llarowe releases the A Box, Indied subscription box. The theme of the May edition was Star Wars and Colors by Llarowe Luke, I Am Your Father was released for that occasion. Colors by Llarowe Luke, I Am Your Father is a jet black holographic shade. The holographic finish is insanely intense and doesn't grey out the base at all which is great. There are also very tiny black glitters suspended in the base but in my opinion they don't really add anything to the overall effect. The formula is quite opaque and easy to handle, I barely had any cleanup when I layed down 2 coats. It doesn't dry particularly shiny so a topcoat is recommend. Because of the strong holo flame, it almost appears a bit as an inky blue shade sometimes. I can assure you it's not! It's just the very present holographic goodness ♥. What do you think of this shade? Something you'd purchase? Tell me in the comments! Colors by Llarowe is the indie brand from the well known stockist Llarowe. Every month Llarowe releases the A Box, Indied which is a subscription box with single boxes available for purchase as well. This isn't probably something I'd purchase - I have 3 or 4 black holos that I love - but I think it looks great on you! Probably one of the strongest black holos I've seen! ohhhh this is so stunning - Must have! Wow, this is beautiful!! Your holo swatches are always amazing! Ok, i've spent all my money now, because of you! :p He's marvellous! Now I wish I hadn't spent my polish allowance! 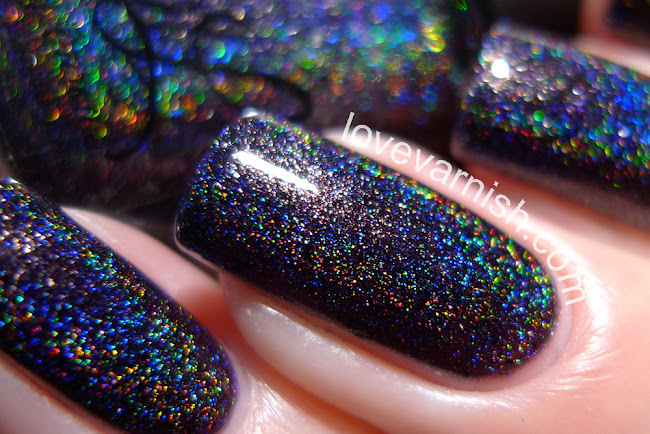 I have yet to try Llarowe holos but this one might be too irresistible! Your holo swatches are always fab! 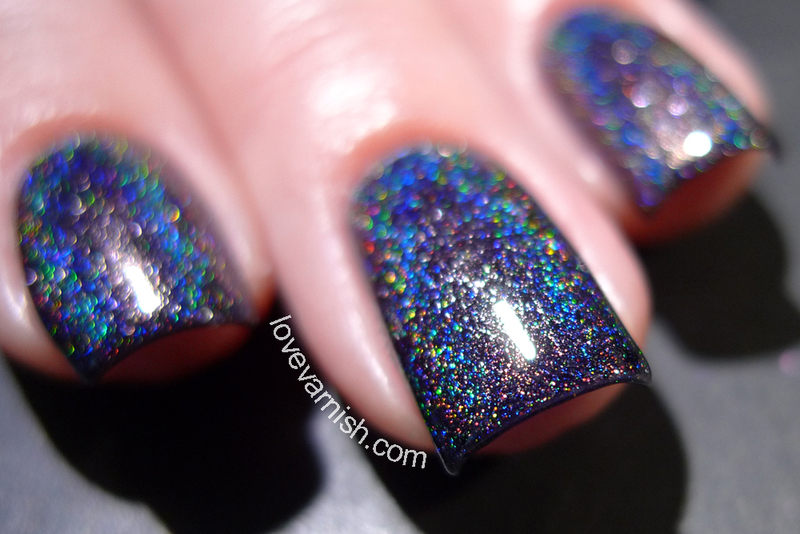 Wow the holo in this is amazing! This is spectacular holographic polish. Its so difficult to capture holographic beauty but your swatches are perfect. Thanks Jessica! I can see why there isn't really a need for a 4th or 5th black, it's not something you wear every day ;). It has a great holo flame! They definitely know how to execute them! Glad you like it Em, even though it's remarkably dark for your taste! And, did you cave in the end :D? It really is - so intense! I have to admit working with artificial light really makes it so easy!